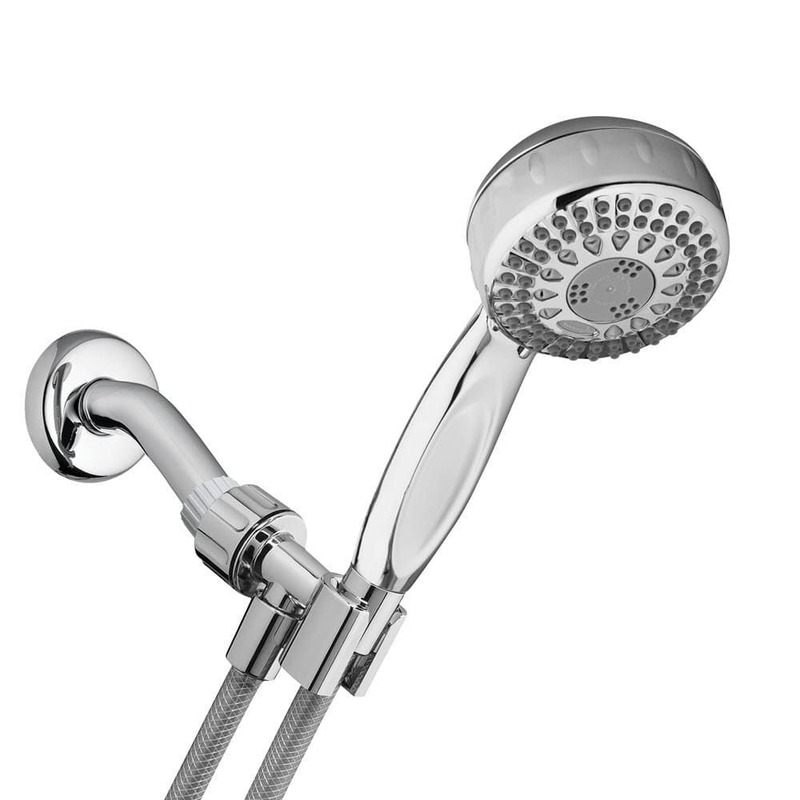 The Waterpik TRS-553 is one of the most affordable hand shower heads on the market today. We decided to look into it because of the extremely high amount of reviews, giving it a good overall score. Let's dive into it and see what we can learn. For a standard shower, it will fit right in. Being made of abs plastic and coated in a nice chrome color... it definitely looks the part when properly installed. With the TRS-553, you get 5 different settings which are slightly different from one another. You first have the Full Body, Full Body + Massage, Pulsating Massage, Slow Massage, and Misting. Each available setting will give you a completely different feel for when the water hits your skin. Selecting between the given settings is quite easy, all it takes is your thumb to click from left to right on the bezel of the shower head. When you open the box, you'll see it comes with pretty much everything you need (aside from teflon tape for some reason...). First will be the 5-foot hose which is fairly generous in length and give appropriate reachability to the user. Assuming you have the standard shower head extension arm that most heads get screwed onto, installing the holder for this shower head is a breeze, requiring very little effort. Connect all the parts together and you'll have a complete system ready to serve you. Whether you want to fix it to a stationary location OR, take full control and use your hand. 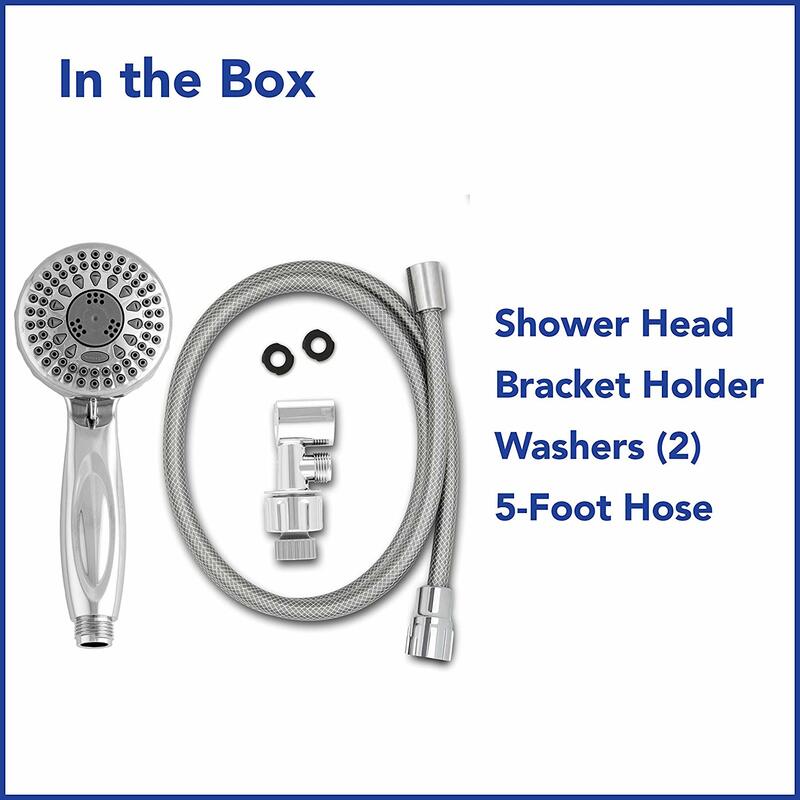 When it comes to the features associated with this shower head, some are universal as with all, and some are specific to just the TRS-553. You want to know what makes having this shower head a worthwhile thing, so let's get into it. OptiFLOW Technology is tech that is patented by Waterpik. In a nutshell, how this works is: inside the shower head, there's mechanisms which channel water more efficiently. As the water is forced to come out from the multiple nozzles, it is pressurized but at a much lower flow rate than others. Rub-clean and anti-clog shower nozzles. This is something that most shower heads today are already implementing to avoid calcium build-up and clogging. It's a nice overall feature that can often go forgotten until something goes wrong. You get peace of mind when you shower, especially when the stream of water goes unchanged in both direction and overall power. Adjustable-angle bracket for easy shower head positioning. This was mentioned above as what holds up the hand shower. How it actually works is a marvel really, first the holder when mounted to an arm is funneling water through the holder, down through the hose and into the wand. AT the same time, it will also hold the wand in a fixed location. Now that we've talked about the features, how about the true advantages. That's what we're going to talk about below.There's no real reason to hype up a produce such as this. There's a handful of true advantages that each person should strongly consider when looking at the Waterpik TRS-553, below are the following. 5-Foot Long Hose Gives You Reachability. The is a great benefit and advantage to having this specific unit. Take control of where you are aiming your water, this applies whether you are an adult or a child. You Can Personalize Your Water Pattern. Almost all come with multiple spray settings and this one is no exception. 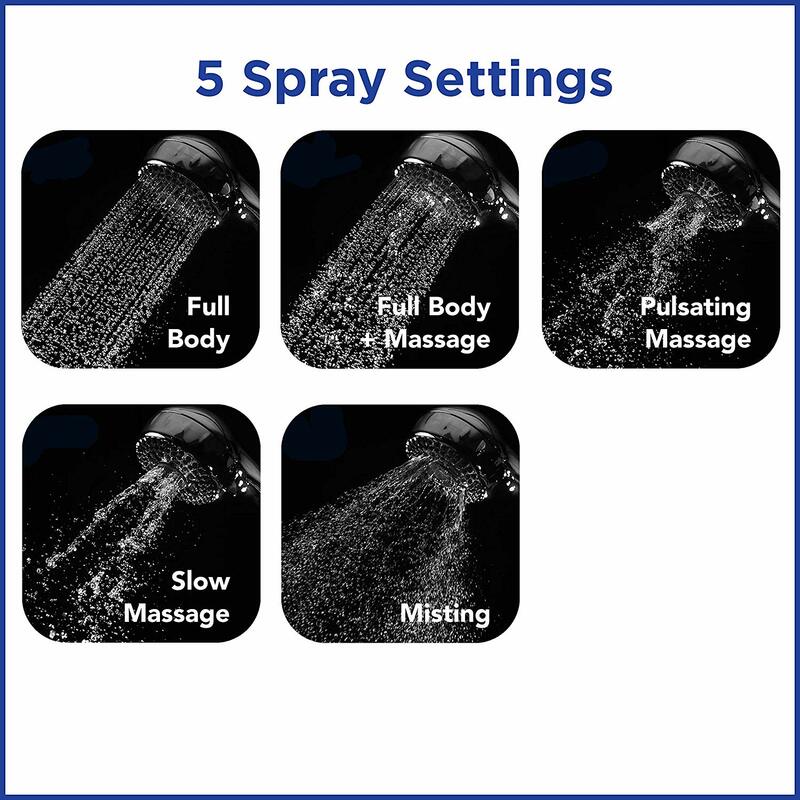 Each of the 5 enables you to tailor the appropriate water pressure and frequency of water touching your skin. Use Your Hand or Use As Stationary. As with most handheld units, you can either take control by using your hand OR, place it inside the holder which is mounted directly extension arm. You can get the best of both worlds with Waterpik TRS-553. Cost For The Whole Package. Lastly, the main advantage of getting this model specifically, is the price. For anything below 50 dollars its worth looking into, but when you are talking about 30 dollars or less, then it becomes a really good deal. For the entire kit, you do get everything essential to install immediately. There's hardly anything I review that does not have any drawbacks, most things have flaws and this one easily has a few. Let's cover the main points that I strongly feel could be better. It's Made of Plastic. While some would assume this shower head is made entirely of metal, they would be wrong. With a beautiful chrome finish, it actually is made of 100% plastic. Long term durability seems to be questionable, as you pretty much get what you pay for. For 30 dollars, if it lasts 1-2 years I'd say that's acceptable and you get your moneys worth. No Teflon Tape Included. When installing the shower head, you'd assume you'd get a little bit of teflon tape, but that isn't the case here. This little very inexpensive item would be very useful when getting ready to install. In my opinion, it's an inconvenience especially when you don't have any and are forced to get some from the store. So there you have it, the entire Waterpik TRS-553 review, I tried my best to cover the most essential aspects of it. Let me ask you this, do you want to see a list of the best handheld shower heads on the market? You can actually do so by clicking the link right above. What its going to do is take you to a main buyer's guide page which compares the ones I found to be the absolute best in every category. I organized them from #1-#10 and in such a way, you'll clearly know which one to choose based on each ones position.